Figure A. Alexa Fluor 647 conjugated Mouse anti Human CD4 (MCA1267A647) and RPE conjugated Rat IgG2b isotype control (MCA6006PE). 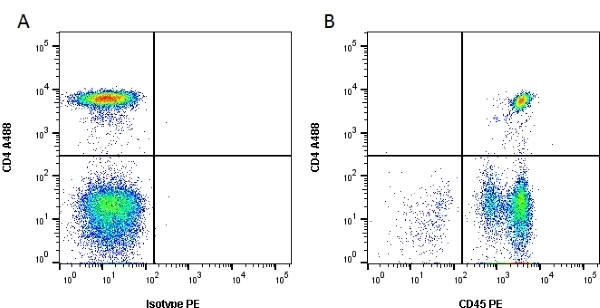 Figure B. Alexa Fluor 647 conjugated Mouse anti Human CD4 (MCA1267A647) and RPE conjugated Mouse anti Human CD45 (MCA345PE). 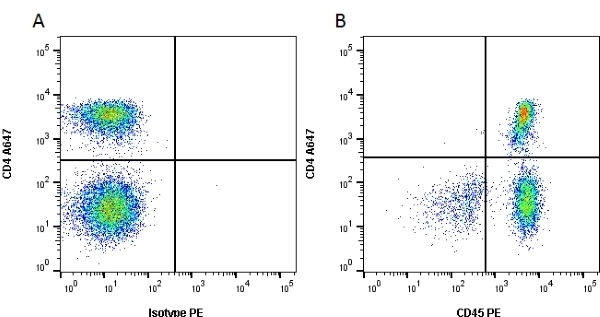 All experiments performed on red cell lysed human blood gated on lymphocytes in the presence of Human Seroblock (BUF070A). Data acquired on the ZE5™ cell analyzer. Figure A. Alexa Fluor 488 conjugated Mouse anti Human CD4 (MCA1267A488) and Alexa Fluor 647 conjugated Rat IgG2b isotype control (MCA6006A647). 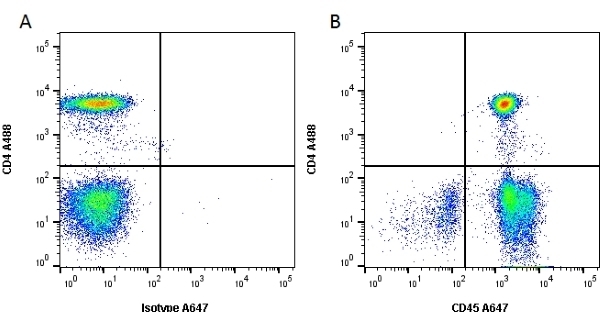 Figure B . Alexa Fluor 488 conjugated Mouse anti Human CD4 (MCA1267A488) and Alexa Fluor 647 conjugated Rat anti Human CD45 (MCA345A647). All experiments performed on Human peripheral blood gated on live single cells, in the presence of 10% human serum. Data acquired on the ZE5 Cell Analyzer. Rat anti Human CD45 antibody, clone YTH24.5 recognizes the human leukocyte common antigen CD45, expressed on all cells of haematopoietic origin except for erythrocytes. The isolation and characterisation of this cell line was carried out with the help of funds supplied by the Medical Research Council, United Kingdom. Spleen cells from an immunised DA rat were fused with cells of the rat Y3/Ag1.2.3 myeloma cell line. Bindon, C.I. et al. (1985) Therapeutic potential of monoclonal antibodies to the leukocyte-common antigen. Synergy and interference in complement-mediated lysis.